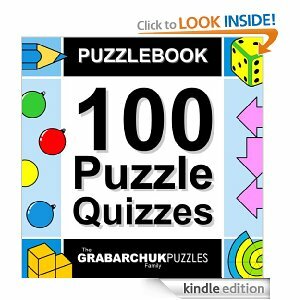 I recently reviewed 100 Puzzle Quizzes by Grabarchuk Puzzles. I was able to download it to the Kindle Cloud Reader. I have stayed clear of puzzles because they tend to become addictive. I’ve played and replayed these three times. The reason is simple. Since these are brain teasers, those I didn’t figure out the first time needed to be re-played. It is true that you can guess your way through each answer to get to the next one. That is what I did, with one exception. I wrote down the puzzles I didn’t get and went back a replayed the game and focused on those games. I would recommend these to those who love to play brain teaser games. They are not too challenging so as to turn off someone like me who struggles finding patterns sometimes. They are challenging enough keep me trying. So what are you waiting for. Check them out. Download an app for your favorite reader.